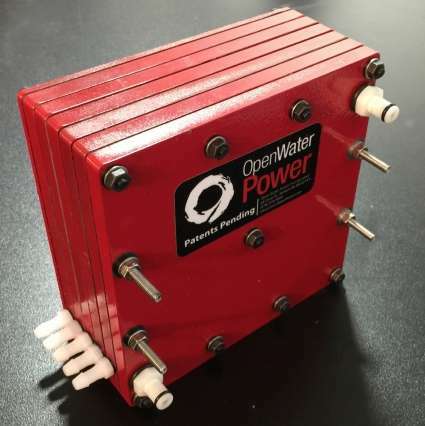 Recently acquired by major tech firm L3 Technologies, OWP has developed a novel aluminum-water power system that's safer and more durable, and that gives UUVs a tenfold increase in range over traditional lithium-ion batteries used for the same applications. The power systems could find a wide range of uses, including helping UUVs dive deeper, for longer periods of time, into the ocean's abyss to explore ship wreckages, map the ocean floor, and conduct research. They could also be used for long-range oil prospecting out at sea and various military applications. OWP is currently working with the U.S. Navy to replace batteries in acoustic sensors designed to detect enemy submarines. This summer, the startup will launch a pilot with Riptide Autonomous Solutions, which will use the UUVs for underwater surveys. Currently, Riptide's UUVs travel roughly 100 nautical miles in one go, but the company hopes OWP can increase that distance to 1,000 nautical miles. "Everything people want to do underwater should get a lot easier," says co-inventor Ian Salmon McKay '12, SM '13, who co-founded OWP with fellow mechanical engineering graduate Thomas Milnes PhD '13. "We're off to conquer the oceans." Most UUVs use lithium-based batteries, which have several issues. They're known to catch fire, for one thing, so UUV-sized batteries are generally not shippable by air. Also, their energy density is limited, meaning expensive service ships chaperone UUVs to sea, recharging the batteries as necessary. And the batteries need to be encased in expensive metal pressure vessels. In short, they're rather short-lived and unsafe. In contrast, OWP's power system is safer, cheaper, and longer-lasting. It consists of a alloyed aluminum, a cathode alloyed with a combination of elements (primarily nickel), and an alkaline electrolyte that's positioned between the electrodes. Think of the power system as type of underwater engine, where water is the oxidizer feeding the chemical reactions, instead of the air used by car engines, McKay says. "Our power system can drink sea water and discard waste products," he says. "But that exhaust is not harmful, compared to exhaust of terrestrial engines." With the aluminum-based power system, UUVs can launch from shore and don't need service ships, opening up new opportunities and dropping costs. With oil prospecting, for example, UUVs currently used to explore the Gulf of Mexico need to hug the shores, covering only a few pipeline assets. OWP-powered UUVs could cover hundreds of miles and return before needing a new power system, covering all available pipeline assets. Consider also the Malaysian Airlines crash in 2014, where UUVs were recruited to search areas that were infeasible for equipment on the other vessels, McKay says. "In looking for the debris, a sizeable amount of the power budget for missions like that is used descending to depth and ascending back to the surface, so their working time on the sea floor is very limited," he says. "Our power system will improve on that." The OWP technology started as the co-founders' side project, which was modified throughout two MIT classes and a lab. In 2011, McKay joined 2.013/2.014 (Engineering System Design/Development) taught by MIT professor of mechanical engineering Douglas Hart, a seasoned hardware entrepreneur who co-founded Brontes Technologies and Lantos Technologies. Milnes, who was previously a systems engineer at Brontes and co-founded Viztu Technologies, was Hart's teaching assistant. The class was charged with developing an alternate power source for UUVs. McKay gambled on an energy-dense but challenging element: aluminum. One major challenge with aluminum batteries is that certain chemical issues make it difficult to donate electrons to a circuit. Additionally, the product of the reactions, the aluminum hydroxide, sticks to the electrode's surface, inhibiting further reaction. Continuing the work in 10.625 (Electrochemical Energy Conversion and Storage), taught by materials science Professor Yang Shao-Horn, the W. M. Keck Professor of Energy, McKay was able to overcome the first challenge by making a gallium-rich alloyed aluminum anode that successfully donated electrons, but it corroded very quickly. Setting up shop at Greentown Labs in Somerville, Massachusetts, in 2013—where the company still operates with about 10 employees—OWP further refined the power system's design. Today, that power system uses a pump to circulate the electrolyte, scooping up unwanted aluminum hydroxide on the anode and dumping it onto a custom precipitation trap. When saturated, the traps with the waste are ejected and replaced automatically. The electrolyte prevents marine organisms from growing inside the power system. Now OWP's chief science officer, McKay says the startup owes much of its success to MIT's atmosphere of innovation, where many of his professors readily offered technical and entrepreneurial advice and allowed him to work on extracurricular projects. "It takes a village," McKay says. "Those classes and that lab are where the idea took shape. People at MIT were doing strong science for science's sake, but everyone was keenly aware of the possibility of bringing technologies to market. People were always having those great 'What if?' conversations—I probably had three to four different startup ideas in various stages of gestation at any given time, and so did all my friends. It was an environment that encouraged the playful exchange of ideas, and encouraged people to take on side projects with real prizes in mind." I wonder if this battery could be used to store renewable energy. The aluminum hydroxide could be turned back into aluminum via excess renewable energy and then used in the battery to produce backup power. I wonder what the efficiency of the whole system could be. An alternative would be to use aluminum as a fuel to power autos. The aluminum hydroxide to aluminum process needs to be able to be started and stopped at will since it will be in operation only when there is excess power available. If the aluminum produced is used as a replacement for fossil transportation fuel the efficiency of the process does not need to be as high in order to make economic sense. Rob Matheson (and your editors): This article would be a lot more a science (or engineering) article than marketing if it started off with paragraph 10, the description of the battery. What we have here is called "burying the lede", unless it's properly called "marketing". This can be done, but not inside the battery. The waste materials have to be electrolysed at high temperature in order to get back aluminium. It is a type of fuel cell, consuming 'Al'. A cartridge system of maybe a magazine of replacement cartridges of 'Al' could keep this thing running indefinitely. Well done fellas!! Could also be used for submarines. No need carry oxidizer as sea water does that! If travel into a 'dead zone' for dissolved O2 then use usual backup power. I don't think subs get their oxygen from the one dissolved in water, like fish. Rather from the surface. This fuel cell is quite a problem once it's exhausted. One would have to throw it away or carry it back in order to recycle the aluminium.